The tarot card the << sun >< represents lust for life, enthusiasm and health. The tarot card the <<sun>> shows a meadow in the sunlight. Two children enjoy playing in the warmth of the sun and having fun. The tarot card the <<sun>< represents lust for life, enthusiasm and health. The warmth of the sun gives light and energy and positive elements enrich good thoughts and reinforce the positive attitude towards life and living. This boost of energy may cause that almost everything seems to be tolerated. Self-confidence, optimism, and new vital energy could have been provided to generate plans and projects on their way. The sun gives the touch of youthful dynamics and topical sorrow and worry could have been vanished in the haze. When the sunlight brightens the sky and the meadow it also brightens your thoughts and your mind as well. The major part of your priority thoughts is not distressed. Full of confidence they start getting adopted on the plan. Your mind is clear and you feel strong enough to face challenge and solution. The obscure side of this card implied - for instance – if another aspect of self –confidence turns into overestimation of one’s capabilities so consequentially as a result appears egoism and arrogance. The tarot card the <<sun>> is a symbol for a warm and close relationship which is supported by affection. It shows cordial contact and sharing the happiness together - often children are important and sometimes such topic like children and family could become dominant and represents priority. Lasting relationships and continuous relationships are supported and singles could have a great golden time as well. so the headline of this card could be: intensifying a golden age - singles and couples likewise found themselves. There is no one who could resist on a golden carpet just lit by sunlight. Beyond the card the <<sun>> you get a smile on your face when you start your day – in the office as well. It stands for a phase of happiness and joy as well. So work goes swiftly from your hand and you feel quite satisfied and without doubts after all. We have really a positive attitude towards topics and colleagues and so it is easy to convince others. 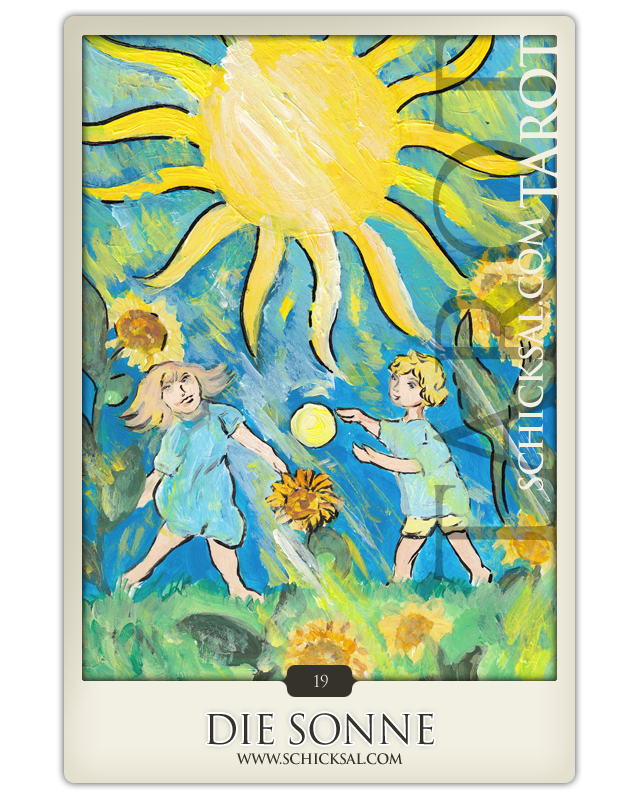 The tarot card the <<sun>> represented: vitality, optionatedness, joy, vividness and strength. He gives you joy and power all day. The challenge of the daily life – of life as well – so you have got the facility that you are able to face with confidence and tolerance. You start your day and you will make of it something special - ultimate ambition is being and becoming an active part. It is you that stay on the ball!